Fortunately, less invasive options are available. Some gynecologic procedures enable surgeons to access the target anatomy using a vaginal approach, which may not require an external incision. 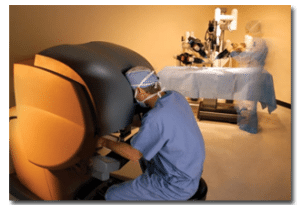 But for complex hysterectomies and other gynecologic procedures, robotic assisted surgery with the da Vinci Surgical System may be the most effective, least invasive treatment option. Through tiny, 1-2 cm incisions, surgeons using the da Vinci ® System * can operate with greater precision and control, minimizing the pain and risk associated with large incisions while increasing the likelihood of a fast recovery and excellent clinical outcomes.